"I think I honestly would feel more proud to put on a USA singlet — even if I never have the opportunity to make the Olympic team — I think I would feel more proud about my accomplishment than just to be handed any singlet to do it. At the same time, there’s just something’s telling me deep inside keeps leaning toward my citizenship and running for this country." "I don’t want to shy away from the competition; I want to be surrounded by elite-level athletes that are contending for medals, and I want to put myself in the situation where, if I want to have the opportunity to be at a world championship, I have to beat sub-13 guys and deal with this process. 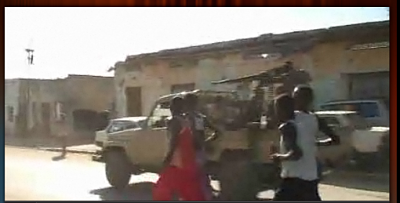 Because — no disrespect — the way I see it, if I can’t beat the American runners, I can’t beat the Africans. I think the level in this country is the right atmosphere for any distance runner to succeed." - Northern Arizona's Diego Estrada who will pass up a trip to race for Mexico at World Champs in the 5k and seek his US citizenship instead. In a time when many elite athletes are taking advantage of dual citizenship or changing citizenship to shy away from harder competition, this "never take the easy way" attitude is very impressive. Coach Canova any thoughts about tonight's Pre 10k & 30k?? Bad Blood Between Solinsky and Rupp? New h.s. 2 mile record!!! *Doctor Says That Sammy Wanjiru Did Not Die From Balcony Fall But From A "Fatal Hit To The Back Of The Head" "Medical experts have zeroed in on two possible scenarios that could have led to the death of Olympics champion Samuel Wanjiru three weeks ago — and they both point to murder." The Barefoot Running Debate: Born To Run, Shoes & Injury: The Latest Thinking The Science Of The Sport guys look at everything you'd ever want to know about barefoot running: the arguments for and against, why your shoes might increase chances for injury, who should/how to make the transition to barefoot and more. IAAF Recap Of Pre Classic: Jeter Wins 100 in 10.70, Oliver Wins 110 Hurdles In World-Leading 12.94 Russia's Ivan Ukhov was supposed to defend his unbeaten streak, but finished 6th place with a jump nowhere near his best. We're not sure if there was an injury or any other factors involved. Caster Semenya Not Dissapointed With Her 2nd-Place Finish As She Was Happy With The Time On the other hand, Allyson Felix wasn't happy with her 3rd-place finish, and neither was Oscar "Blade Runner" Pistorius, who failed to hit the WC's "A" standard of 45.5, running 46.33 for last place. Ashton Eaton Gets A PR By .2 Seconds In 110 Hurdles, Running 13.35 *Eaton Says Lining Up Next To David Oliver And Liu Xiang Is "Like taking Jennifer Lopez to the prom." Mo Farah: "What I run, (Rupp) would have run." 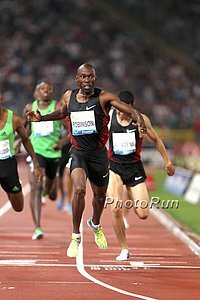 Bernard Lagat Talks About Racing In Eugene And His Thoughts Leading Up To The Pre Classic 2 Mile He says that even with the stellar field, he doesn't think anyone will come close to the WR, as it's a morning race and just a really impressive time to hit. A Brief Chat With NCAA D2 10k Champ Sarah Porter, Who Has Run Up To 135 Miles In A Week And Definitely Gets The Unofficial LetsRun.com Stamp As "Blue Collar" The NCAA in its brilliance almost kept Porter out of the NCAA champs because she donated money she won at a road race to a charity of her choice and not the race's. Porter is someone blue collar runners can appreciate, as she's run up to 135 miles in a week. Blue Collar 100% (But With Yuppie Gadgets & Resources) Before Figuring Out She Was Injured, Paula Radcliffe Was Worried She Might Not Have It Anymore The article also reveals Radcliffe may run the Berlin marathon. Drug Cheat Justin Gatlin To Compete At Pre Classic Can someone tell us why Dwain Chambers - a man who admitted to doping and cooperated with the authorities - is still blackballed while Gatlin is welcomed with open arms? 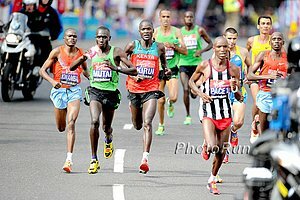 Update On "Vinny Strikes Again"
Portland's Alfred Kipchumba Was Tripped In Men's 10k And Not Advanced To Next Round, But Oregon's Boru Guyota Was Advanced Despite Not Being Knocked Over & Portland Coach Rob Conner Is Fine With The Ruling The NCAA apparently differentiates between locations and not rounds at NCAAs, as they are concerned with cost. The same thing happened to Kendra Shaaf of UNC, but since Schaaf also made it in the 5k, we don't know why they don't also let her run the 10k. We Hate Blogs, But This One Is Pretty Good: Ryan Hall's Sister Overslept Her Alarm - Missed Bolder Boulder Start Hall also gives insight into his training and has high praise for Bolder Boulder, as he says running into "CU's packed football stadium was epic. I promise everyone, it is nearly as good as running into the Olympic Stadium." Coach Bob Kersee Says Allyson Felix Most Likely Won't Double At Worlds The decision hasn't been made yet as he also added, "I don't have problems being greedy a little bit ... It still might happen." A Politician We Actually Like: London Mayor Misses Out On Olympic Tickets Most politicians would demand VIP freebies. LRC The Week That Was Last week, Usain Bolt shocked the world by barely winning, whereas Khadevis Robinson shocked the world by winning convincingly, World XC champ Imane Merga picked up the track season right where he left the XC season, and two female stars trying to rebound from sub-par 2010s had totally different results, as Maryam Yusuf Jamal shined and Sanya Richards-Ross struggled. 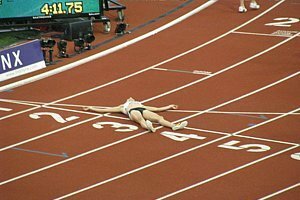 Paula Radcliffe returned after an 18-month hiatus and struggled as well. Along the way, the NCAA regionals were held and Vin Lananna complained about the format even though his men and AJ Acosta greatly benefited from it. Along the way, Jos Hermens may have jinxed his star pupil Yenew Alamirew, who turned 21 last week. Paula Radcliffe Is Upbeat About Her Chances: "I know deep down if I'm healthy I can still get in (to contention)." 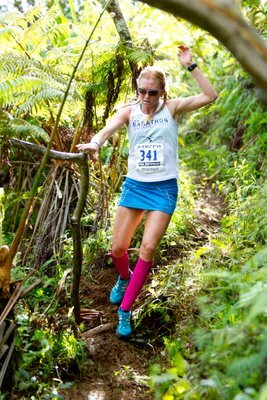 Back From EPO Ban, Texas-Based Kiwi Liza Hunter-Galvan To Race Marathon In NZ This Weekend Can someone please tell us why EPO doesn't automatically result in a lifetime ban? There is no way to accidentally take it. Paula's Return Is A "Bit Of A Disaster" & Results In Tears At Finish The marathon world record holder hadn't raced in 18 months and her much-anticipated return to action went horribly wrong. A tear in one of the discs in her back resulted in her generating no power and running a slower pace for 10k than she'd like for a marathon (33:17). Radcliffe: "I didn’t have any power." *Recommended Listen: BBC Audio Interview Of Teary Radcliffe, Who Says She Was "Embarrassed" But Explains Her Medical Problem Radcliffe says her track sessions had been a struggle, but her road sessions had been good. *Racers Give Olympic Course A Thumbs Up It's interesting note that this says the Olympic marathon will be run at 11 am to placate Japanese and US television audiences. *Pavey Will Decided On World Championship Marathon In Next Few Days Did we even mention that Brit Jo Pavey won the race? *Recommended Read Q&A With Bolder Boulder Founder Frank Shorter Shorter talks about his most courageous race and says he still runs an hour every day. Swiss Lab Director Says Lance Armstrong Didn't Test Positive But Admits There Were 4 Suspicious Tests And He Has No Idea If Those Belonged To Armstrong Or If The UCI Followed Up On Them Correctly (Although He Assumes They Did) He also admits he did meet with Armstrong to talk about EPO testing in 2002. Bolota Asmerom Calls For Tougher Doping Rules We like his suggestions: 1) Lifetime bans 2) Forced payback of all prize money. 3) Erasure of all performances for whole career. 4) A Dopers Wall of Shame. But we have no idea why marijuana is banned. 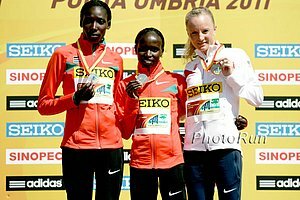 TCS World 10K Recap: Ethiopia's Dire Tune Win's Over Fast Women's Field Dire Tune ran 33:19, barely winning over Merima Mohammed. 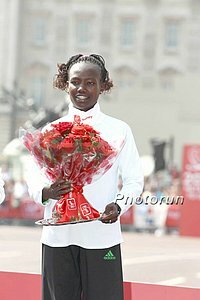 Field also included world leader Doris Changeywo, last year’s runner-up Aselefech Mergia, and Edna Kiplagat (3rd at London Marathon). Kenya's Philemon Limo won the men's race. World Leads For Blanka Vlasic In The HJ And Viola Kibiwot In The 3k (8:46.84) At Rabat In the 100m, Asafa Powell pulled up about 30m in with a hamstring injury. His manager says he doesn't think it is serious though and hopefully not because Jamaica picks it's team for WC's in 18 days. Tyson Gay's 9.79 WL Came In The Prelims Of A Low Key Event In Florida While Bolt and Powell are running at major Diamond League meets, Gay is running faster than both of them in the prelims of low key events where he is unchallenged. Six National HS Records Fall Over Weekend Gunnar Nixon's 8,035 pts in the decathlon, Verzbicas' 8:29.46, Amy Weissenbach 2:02.04 in the 800, Mary Kate Anselmini's 6:33.01 2k steepke, and Andrew Irwin's 17-7 indoor pole vault (outdoor record is 18-3 and we have no idea why the meet was indoors in June). Fast Times Expected In Women's 800 At Oslo Diamond League Thursday Field includes world leader Mariya Savinova (1:57.56), Caster Semenya coming off a 1:58.88 at Pre, UK's Jenny Meadows (1:57.93), former World champ Janeth Jepkosgei, and Russians Sevetlana Klyuka & Ekaterina Kostetskaya both with PR's in the 1:56 range. Northern Arizona's Diego Estrada Passes Up A Trip To World Champs And Opts For U.S. Citizenship Estrada is the only Mexican citizen with the "B" standard, but he has decided to become a US citizen instead of representing Mexico at WC's. "Even if I never have the opportunity to make the Olympic team - I think I would feel more proud about my accomplishment than just to be handed any singlet to do it. ...I don’t want to shy away from the competition." France’s Mekhissi-Benabbad Shooting For European Steeplechase Record (8:01.13) He could also be the first European under 8 minutes. *The Olympics Is A "High-Reward Gamble" For Television Networks Bidders have to bid so much, so far in advance, it is hard to determine how profitable it will end up being 4-5 years down the road. IAAF Recap: Enea Cup European Athletics Festival Phillips Idowu wins TJ with wind-aided 17.52m; competitive 800 with Poland going 1-2 in Adam Kszczot (1:44.30) and Marcin Lewandowski (1:44.61). World Champ Mbulaeni Mulaudzi faded to 5th, more than 2 seconds behind the winner. 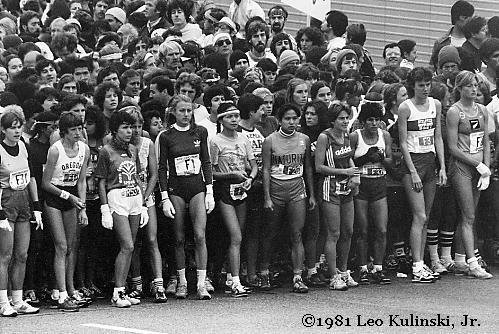 *Bob Kennedy Among Those Running Holiday "Fun Run" Marathons At Van Cortlandt Park Races with no sponsors, no entry fees, funded/organized by volunteers and donations. They've held one on Thanksgiving, Christmas, Valentine's Day, Memorial Day and plan to continue with other holidays as well. 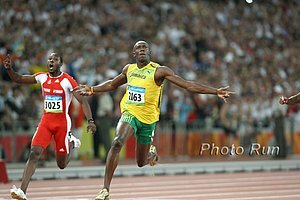 *Tyson Gay Has the World Lead, Is Usain Bolt's Reign Over? IAAF Recap Of "Gran Premio Iberoamerican" Russia's Aleksey Dmitrik sets HJ world lead at 2.35m. 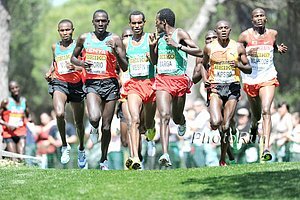 Previews: IAAF Preview Of Bangalore World 10k Olympic bronze medallist Micah Kogo Kemboi and defending champ Titus Mbishei headline field. Preview Of Saturday's European Cup 10k Helen Clitheroe making her 10k debut ... better late than never. 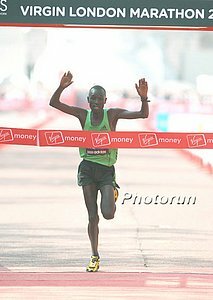 San Diego: Meb (And Martin Lel) Returning To San Diego To Run This Weekend's Dodge Rock N Roll Half Marathon No one is making a big deal of it, but Meb is facing the incredible Martin Lel (2nd at London) in the half. The Intrigue Gets Bigger & Bigger As Doctors Visit Wanjiru's House And Then One Says: "This is not a simple matter." Doc: "He landed on his legs and supported himself with his hands. Where did the injury on the back come from? We could turn into fools if we don't ask ourselves this question." That's a good question. Our suggestion - fly an expert in. Good News: World Record Holder David Rudisha Says Injury Is Gone And He'll Be Back In Action On June 30th Even better news is that Rudisha said he could have competed in Rome last week but he wanted to be safe. From Fat Drinker To World Beater, Ben St. Lawrence Is Now Dreaming Of An Olympic Medal "I want to sneak into a medal, upset the formbook with the supposed invincibility of the Africans." The Real Reason We've Been Pumping Up Jeff Riseley The Last Few Weeks - Riseley Blogs His Love For Dirk Nowitzki Please don't post love for LeBron on the message boards or it will be deleted, as LRC was founded by Dallas natives. Struggling AJ Acosta Tells How He Was Able To Qualify For NCAAs In 1,500 After Finishing 7th At PAC-10s - "I treated (regionals) as the NCAA final." We like this article, as it provides great advice to up-and-coming mid-d runners. 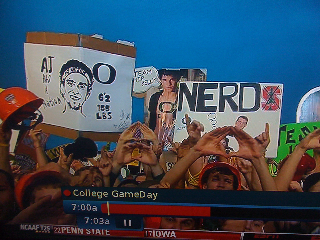 AJ apparently share some of our same beliefs about mid-d racing. Remember: 1) It always opens up and 2) Don't kick too early. "I didn’t want to make the same mistake I made at PAC-10s, which was all-out with 300 meters to go. I kind of closed my eyes a little bit and was telling myself to be patient, something will open up, because I didn't want to swing out to lane three. I told myself just be patient, it will open up, it will open up, it will open up." George Hincapie, Like A "Brother" To Lance Armstrong, Reportedly Testified Armstrong Doped A day after Olympic champ (and liar and cheat) Tyler Hamilton said Lance Armstrong doped, George Hincapie, who is like a "brother" to Lance, reportedly told the grand jury Lance doped. This is big news because many, including just today The Ticket (a top 5 sports radio station in America), said if someone who was more credible like Hincapie came forward, it would bear more weight. Tyler Hamilton Confession Letter He explains to his friends why he lied for so long. 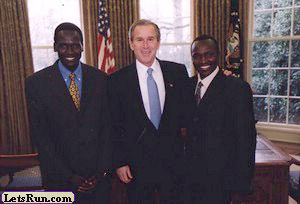 Excellent Read: Toni Reavis - "I am Sammy Wanjiru!" Well worth a read. Quote of the day. Brett Larner With A Fabulous Compilation Of Quotes On Sammy Wanjiru's Life, Career And Death Well worth a read as well. 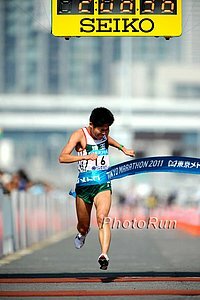 Gives you a good sense on the Japanese influence on his marathon career and his mental toughness.